The bond exchange traded fund asset class has been attracting more attention as investors look for ways to adapt in a changing interest rate environment. “You’ve got over 625 billion dollars now in fixed income ETFs. It’s truly a disruptive innovation – the ability to uses these capabilities to build portfolios,” John Hoffman, National Sales Director, RIA, Invesco, said at the Charles Schwab IMPACT 2018 conference. 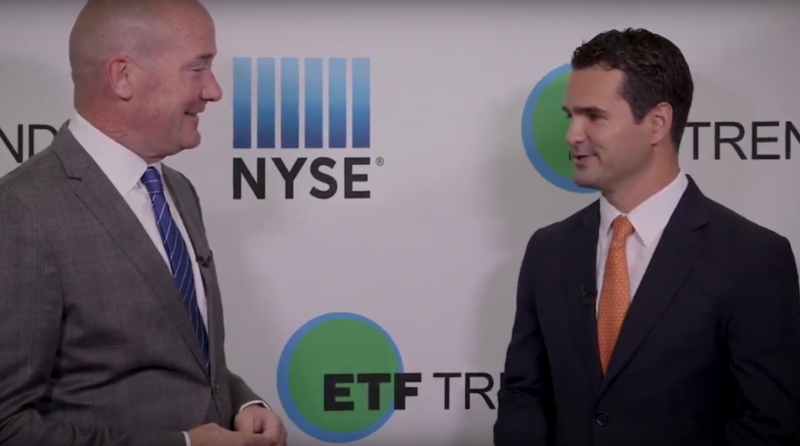 For example, Hoffman pointed to Invesco’s line of BulletShares bond ETFs that help investors gain defined maturity exposure and add on to a bond ladder portfolio strategy. Invesco recently extended its BulletShare lineup with the BulletShares 2028 Corporate Bond ETF (NYSEArca: BSCS) and BulletShares 2026 High Yield Corporate Bond ETF (NYSEArca: BSJQ). Invesco also expanded into the emerging markets with Invesco BulletShares 2021 USD Emerging Markets Debt ETF (NYSEArca: BSAE), Invesco BulletShares 2022 USD Emerging Markets Debt ETF (NYSEArca: BSBE), Invesco BulletShares 2023 USD Emerging Markets Debt ETF (NYSEArca: BSCE) and Invesco BulletShares 2024 USD Emerging Markets Debt ETF (NYSEArca: BSDE). “That’s helping advisors, you know, really target duration and build ladders, which is really great in this backdrop,” Hoffman added.